Buy direct from the publisher: $34.99 Only $20.99! Are discipline and formality at odds with flexibility and agility? When are control-driven vs. experimentation-driven approaches most effective? Can we make creativity happen in a software organization? Which is more important, process or product? How do theory and practice interact in the software field? Can practitioners and academe complement each other more effectively? Is there a missing link between creativity and software design? What is the balance of intellectual and clerical tasks in software work? Can we still find a place for plain old fun? 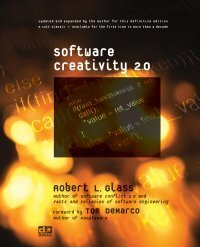 Software Creativity 2.0 also features a new Foreword by Tom DeMarco, co-author of Peopleware and Waltzing With Bears, and a new Preface by author Robert L. Glass. Steve McConnell, quoted from his reader review on Amazon.com. 40% Off the Cover Price! if you have any questions, comments, or requests. Discount Pricing Now on Amazon.com! Editor and publisher of The Software Practitioner newsletter. Subscribe to Robert L. Glass's longstanding newsletter The Software Practitioner.